Are you planning a wedding on a budget? 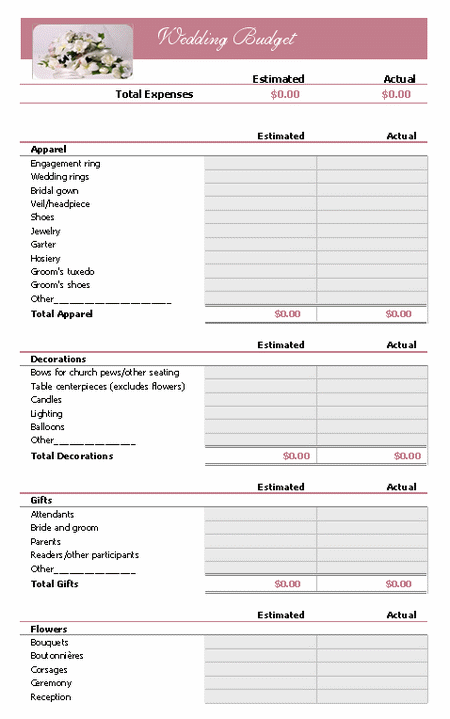 Then this printable wedding budget spread sheet will help you keep a close eye on the costs of your wedding. This wedding budget spreadsheet will help you calculate the costs involved. It is itemized to make sure you don’t forget anything on your special wedding day. You don’t need to worry about adding up the costs as the wedding spread sheet does it all for you. Just download and open it with Excel put in the figures for wedding items. To help you get the best use out of the spreadsheet have a look at how to create a wedding budget.